Palms, Bananas, All Monocots…Oh My! Their Similarities and the Differences that Distinguish Them From Dicots…and why this should matter to you! I use a lot of Monocots in my garden, among them in this picture are the Colocasia esculenta ‘Black Magic’ with its huge dark velvety heart shaped leaves, Arundo donax ‘Variegata’, the Giant Reed, whose clasping leaves show us that this is a grass not a bamboo and the white speckled, green, heart shaped leaves of my Zantedeschia x elliotiana ‘Flame’ just behind the reaching stem of Arundo. This entry was posted in Botany, Flowering, Growth and Cell Division, Horticulture, Maintenance and tagged Agave, Aroids, Bamboo, Bananas, Bulbs, Grasses, Monocots & Dicots, Orchids, Palms on April 29, 2017 by gardenriots. All of the roots on the street side are broken. The storm came out of the south. Monofilament guy lines were supporting it from the east and north. This entry was posted in Flowering, My Garden and tagged Agave on October 16, 2016 by gardenriots. This is one of the lower umbels, the second peduncle from the bottom. The others contain more individual flowers. This umbel was caught in the stage where the filaments are collapsing and the styles extending. Nectar has spilled to many surfaces. The tepals have begun to shrivel as well. Coarse pollen grains show on the anthers with some ‘spilled’ to other surfaces. Individual flowers aren’t particularly pretty. Flowers can be ‘incidentally’ beautiful. We often selfishly view them as products of nature intended to fulfill our own hunger for beauty, failing to recognize them for what they are, living organic structures evolved over time to continue their own species, organs and tissues meant to attract the necessary attentions of pollinators, to produce the seed of generations to follow. We, as a society, have learned to view a select few of these as beautiful. We respond to them in a way not unlike the pollinators themselves do, and by either ignoring them or focusing our attention upon them, we too alter their future form and their very existence. Sometimes we do this more directly through choosing the plants we want around us. Other times it is our indifference that seals the fate of a plant or landscape, especially when the flora is unable to grab our often preoccupied attention and we clear land for development wasting all of the ‘lesser’ weedy natives we’ve learned to undervalue, or, through our efforts to ‘improve’ plants by controlled breeding and hybridization, intentionally altering their form even the conditions under which they will grow. Sometimes, in our desire, for fashion and an idealized beauty, we attempt to control and remove that which we don’t want, creating sterile flowers, the antithesis of what a plant would ‘want’. We select for bloom size, scent and color, for period of bloom, we seek to increase the number of petals and alter the pattern they may be held in, even the lifespan of the individual flower, the height of the plant so that it doesn’t flop over, the ability to grow it in more sun or shade, the shape and color of leaves and the form of the whole plant. We attempt to control all of this and crank out a uniform product that can be ‘plugged’ into landscapes and gardens as desired. Plants with dependable performance characteristics, a pedigree. This entry was posted in Flowering, Plant Communities, Plant profile and tagged Agave, Bees, mutualism, Pollinators on August 21, 2016 by gardenriots. 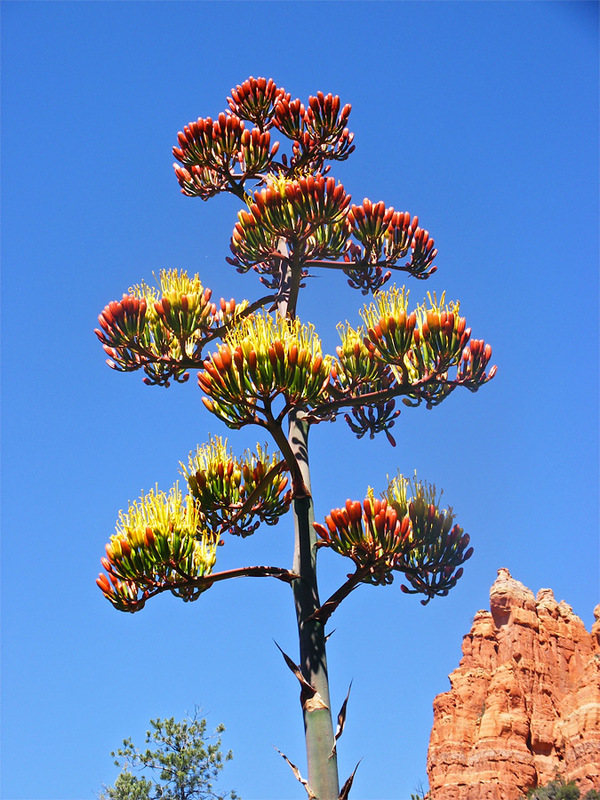 Agave parryi with both secondary and tertiary peduncles and the elongated yellow anthers ‘floating’ above, in Sedona, Arizona. From americansouthwest.net. As gardeners we come to know our plants, what to expect from them over time, how we can better meet their requirements, and their contributions to the garden. If we watch we learn when to expect their spring time resurgence, the extension of stems and unfurling of leaves. We anticipate their flowering often recomposing vignettes to best display them. They teach us over time. But with Agaves their flowering is so infrequent, that if we don’t study them in mass over a span of years, we won’t know what to expect. With some it can take as few as six years, some even less, while others will keep us waiting for 30 or more. When we buy a year old grafted Magnolia we are told to be patient and we understand that the tree will take some time to grow and mature. So we wait knowing that once it begins a Magnolia will increase in both size and floral performance rewarding us for many years to come…but with Agave, it is once and done. This entry was posted in Flowering, Horticulture, Plant profile and tagged Agave on June 7, 2016 by gardenriots. My picture, but not my plant. Alas! I just potted my start up to a 1gal purchased from Sean at Cistus. Agave ovatifolia ‘Vanzie’. Several of these big beautiful cultivars are growing in the Ruth Bancroft Garden, in Walnut Creek, CA. We visited on a nice 80F+ day last October. It is distinguished from the species by its undulating longitudinal waves across the wide guttered leaves. Each leaf can be over 10″ across. 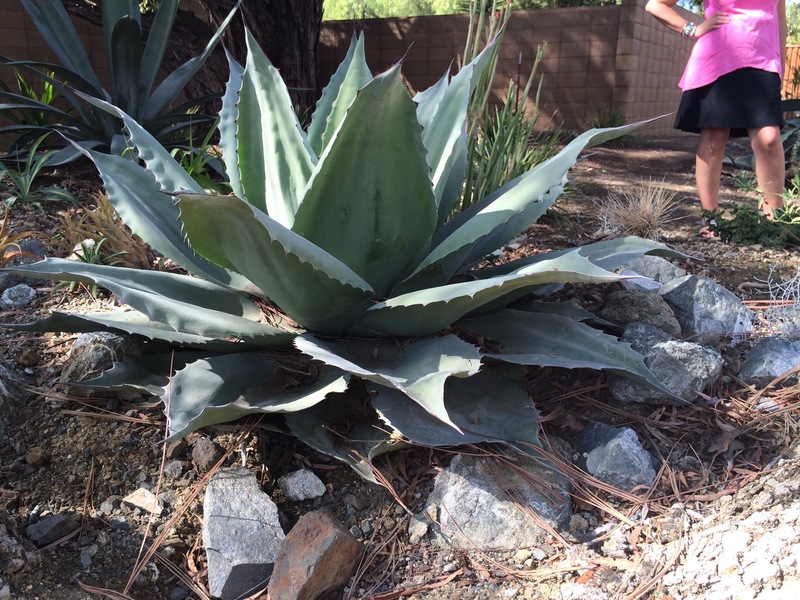 This entry was posted in Horticulture, My Garden, Plant Choice, Plant profile, Practice, Site Analysis, soil drainage, Xeric, Zonal Denial/ Tropicalisimo and tagged Agave on May 4, 2016 by gardenriots.